The Math of a Big Loss - What is Needed to Recover Investment Losses? Think it can’t happen? Think again. Millions of people were headed for retirement with heavy equity concentrations in 2008 when the Dow began its precipitous fall, losing about 54 percent when all was said and done.2 And that’s the market return for a diversified, blue chip portfolio. Many investors with more concentrated, leveraged or sector heavy exposures experienced the aforementioned 80 percent decline or more. With market indices once again hitting all-time highs and pre-retirees all too eager to ride the equity wave, the issue—and danger—is apparent. Call it the (bad) luck of the draw; the value of the portfolio decreases at the exact moment individuals begin withdrawing assets for day-to-day living expenses and other issues; assets that are then unavailable to participate in the rebound that is sure to follow. 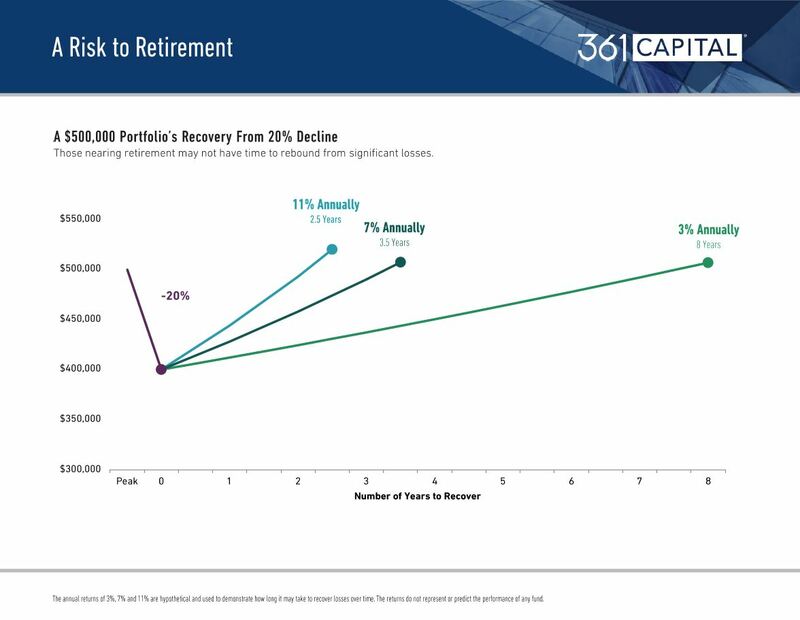 Known as sequence-of-return risk, it can decimate even the best-laid retirement plans. The havoc caused is something from which the retiree will most likely never recover, diminishing the quality of life of which they’ve dreamed. Too many investors fail to realize that it’s not only about the loss of monetary resources, but also the loss of time in which to make them back. For young investors just starting out, its impact is negligible. Not so for their older counterparts, one reason sequence-of-return risk rises with time, and at its highest just before retirement. So aside from starting young, what can be done? Alternative investment strategies are one answer; so-called non-correlated asset classes that rise and fall independently of stocks and bonds can mitigate losses and enhance returns in increasingly volatile investing environments driven by hyper-connected global markets. Long/short equity, one particular hedged growth investment strategy, can limit volatility within the portfolio, stabilize the sequence-of-returns and narrow the possible outcomes to help investors and their advisors better plan. Indeed, long/short equity strategies lost about 20 percent, on average, during the aforementioned financial crisis. Yes, it was painful, but nowhere near the losses of 50 percent or more experienced by many equity indexes. Traditionally reserved for the “satellite” portion of the portfolio, its ability to participate in equity markets while managing downside risk is fueling an argument for long/short equity as a core position. It is, after all, a strategy that invests in equities, and more often than not, does so with net exposure to equites well below 100 percent. As such, it ends up looking quite similar to a more diversified combination of equities and cash or bonds. Long/short equity portfolio managers and analysts also expend tremendous effort in identifying investment opportunities with higher expected risk-adjusted returns than the overall market. Through these efforts, they likewise come across securities with lower expected risk-adjusted return proﬁles. Long-only equity portfolio managers utilize such information primarily to avoid stocks with poor outlooks. Long/short managers, on the other hand, are afforded greater ﬂexibility to fully express their views on all securities that they research, improving investment efficiency. Hedged growth strategies such as long/short equity potentially turns the math of a big loss into an equation for a big gain, by lessening the amount of risk, and the time-horizon needed to recover, helping to ensure the individual doesn’t run out of money before they run out of life. It’s not only about the loss of monetary resources, but also the loss of time to make them back. Jumping in and out at what investors believe to be opportune moments only serves to inflict further damage. Long/short equity can limit volatility within the portfolio, stabilize the sequence-of-returns and narrow possible outcomes.